Mary Farrar poses for a photo with Gov. 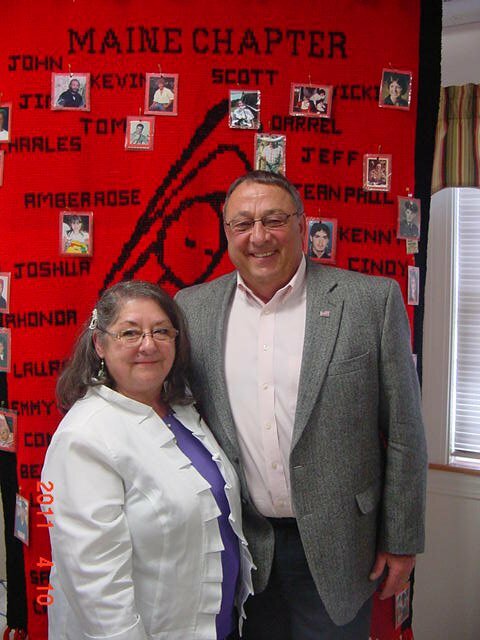 Paul LePage at a meeting of victim advocates held earlier this year. Farrar will receive a national award next month for her work from Parents of Murdered Children. AUGUSTA, Maine — Mary Farrar knows what it’s like to have a loved one murdered. That’s one of the reasons she was so good at her job as victim-witness advocate for more than a decade in Maine Attorney General’s Office, which is responsible for prosecuting homicide cases. Next month, Farrar, 62, of Solon will receive the Father Ken Czillinger Award from Parents of Murdered Children for two decades as a victim advocate at the organization’s annual convention in Milwaukee. The award is presented each year to “an extraordinary professional who has shown understanding and support to survivors of homicide victims through various means,” according to the organization. Czillinger was a Catholic priest in Cincinnati to whom Robert and Charlotte Hullinger, the couple who founded Parents of Murdered Children, turned to when their daughter was murdered in 1978. The award was established in 1992 and named for Cziillenger, a bereavement specialist. When Farrar applied in 1990 to be advocate for victims of crimes in Somerset County, she had no experience in the field. She had been a stay-at-home mom, a substitute teacher and a bank teller. She had never worked in the social service field. What she had, was a whole lot of empathy for the victims of crimes, especially those whose loved ones had been murdered. In 1974, her 29-year-old brother was shot and killed in hold-up at the family business in Newark, N.J. He left behind a 25-year-old wife and four children between the ages of three months and 11 years. It was after William Nicola died that Farrar and her husband, an electrician moved to Maine seeking a sense of safety. That changed in 1984 when President Ronald Reagan signed the Victims Bill of Rights. States were obligated to provide support for crime victims. Farrar left the Somerset County District Attorney’s office in 1996 for the Attorney General’s Office, where she worked solely and closely with the families and friends of homicide victims. She provided notification of the victim’s death, explained autopsy reports, helped families understand the criminal justice system and prepared them for trials, verdicts and sentencings. Once a case was concluded, the separation from detectives and prosecutors could be difficult, he said. Farrar was good at help people understand that it was time for them to move on. Howard S. Klerk Jr. of Richmond is vice president of the Board of Trustees for the national organization Parents of Murdered Children. He nominated Farrar for the award. Farrar went to work last year as a victim advocate in the Department of Corrections. She works less directly with victims of types of crimes but helps collect restitution owed to victims and notifies them when a perpetrator is about to be released. She will retire later this year and is looking forward to the award ceremony next month. “I’m just honored that a group that has given me so much, would do this,” Farrar said.